If you own a pet, then there’s a good chance that your mind may occasionally wonder how they would be cared for if anything were to happen to you. Our furry, finned, and feathered friends can fill our lives with joy, but how many of us ever take the steps needed to show our appreciation by securing their well-being? We can provide you with the tools you need to ensure that your beloved companions receive the attention, support, and love they deserve, even after you’re gone. Pet lovers should know that millions of beloved companion animals have ended up in squalid living conditions at shelters and other facilities after their owners’ deaths. Your pets are dependent upon you to provide them with the care and support they need to survive in your home. They’re just as dependent upon you to ensure that they’ll be taken care of when your life comes to an end. When is the best time to make a pet plan? What elements are included in a pet plan? What can a pet planning attorney do for me? Your guiding principle as a pet owner should be that your beloved companion animal deserves your protection at every stage of its life. Often, when we’re young, we assume that we’ll live forever and that pets are but temporary companions. At other stages in life, we sometimes assume that one of our loved ones will take up the charge of caring for our pets when we die. The reality is that none of those things can be taken for granted. The most important thing that you can do for your animal friend is ensure that you provide for its care if something happens to you. And the best time to start considering the pet planning needed to make that happen is the first day that you bring the animal home. Just as you should add your newborn baby to your estate plan as soon as you can, you should also move quickly to provide for your pet’s future. Whether you’re young and single or older and married, you owe it to your pet to create a plan that provides a suitable guardian and financial support to care for its needs when you’re gone. You cannot put it off, since illness, accidents, and death can strike at any time in life. Litherland, Kennedy & Associates, APC, Attorneys at Law can provide the pet planning assistance you need to secure your pet’s future as soon as possible. Rather than wait until you’re sick or incapacitated, you can provide for that animal’s care now by creating a pet plan that guarantees that it receives the loving home and comfortable life that it deserves. A named guardian. You must find someone willing to take in your pet if you die or become incapacitated. It should be a person who wants your pet and can be trusted to provide it with the care and love that it deserves. You should also choose a backup guardian, since it is always possible that changing life circumstances could cause your first choice to change his mind. Optional monetary support. One of the biggest obstacles to finding a suitable guardian can be the cost factor involved. Caring for a pet can be an expensive proposition, with animals like dogs and cats sometimes costing hundreds or even thousands of dollars a year. For the average pet owner, that’s a small price to pay for the love and companionship a pet can offer. For someone who’s just trying to honor your memory, however, that expense may seem like a burden. You can alleviate some of that burden by leaving behind money that can be used to pay for the animal’s food, vet bills, and other important expenses. Just remember that you cannot leave the pet money directly, but instead need to leave it in the care of a human who will use it for the pet’s benefit. You might want a trust. A pet trust can be an effective way to leave money for your pet. The trustee can then use the funds in the trust to ensure that your pet’s guardian has the financial support needed to properly care for your beloved companion. The trust has the added benefit of legally binding the trustee to use the money only as directed by the terms of the trust. 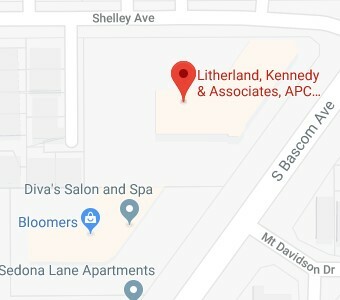 At Litherland, Kennedy & Associates, APC, Attorneys at Law, we understand how important your animal companion truly is, and we want to help you ensure that your pet is properly cared for if anything ever happens to you. Untold numbers of pets end up euthanized each year, or spend their remaining days in shelters because their owners never knew that they could provide for their care even from beyond the grave. We can help to ensure that your beloved pet doesn’t suffer that fate. Call us today at (408) 356-9200 in Campbell or (831) 476-2400 in Aptos or contact us via this website to find out how a California pet planning attorney can help you give your pet a second lease on life.